The Mercedes-AMG GLS 63 underpins our philosophy of driving performance with great self-assurance. Its powerful and distinctive design and impressive dimensions acknowledge only one style: its own. Its interior reflects the absolute symbiosis of dynamism and luxury. There is a prevailing willingness to perform and a healthy conviction that you can achieve anything if you just want to. The AMG 5.5-liter V8 biturbo engine with its impressive maximum power of 430 kW (585 hp) and 760 Nm is the right drive. What a start: The front spoiler with its A-wing design and voluminous cooling air intakes sets the mood for the first impression. This is followed by flics for better aerodynamics and a striking radiator grille with twin louvre in matte iridium silver with AMG lettering. The wheel arches have been widened by 44 mm for an even broader stance. All these design elements underscore the position of the GLS within AMG’s range of high-performance SUVs; it’s the S-Class among SUVs. And its charisma is tailored to those, whose sheer presence is compelling. The exhaust system reveals that the Mercedes-AMG GLS 63 is able to confirm this presence at any time with its emotional V8 sound like a drumbeat, as is typical for an AMG. With its AMG design features and LED High Performance headlights, the front end expresses dominance and exclusivity. 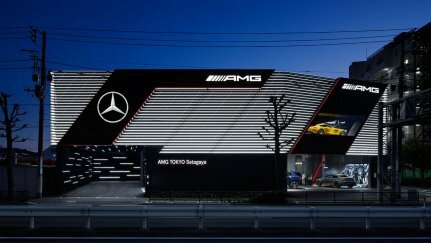 Distinctive features include the AMG front apron with A-wing, large cooling air intakes and a diamond-pattern grille, as well as flics for even better aerodynamics. The AMG radiator grille with twin louvre in matte iridium silver and with "AMG" lettering, distinguishes it from the standard series radiator trim, and underscores the characteristic AMG look. The side design is characterized by specially sized design features like 21-inch (53.3 cm) AMG light-alloy wheels, AMG-specific wheel-arch flares and illuminated, running boards with an aluminum finish. In addition, the side design features sporty highlights like the AMG high-performance braking system and hallmark AMG "V8 BITURBO" lettering. Thanks to the AMG design, the rear end is dynamic and distinctive: the AMG rear apron with black trim strip serves as a defining feature, while the AMG sports exhaust system, with two chrome-plated twin tailpipes and "AMG" lettering, underscores the sportiness and exclusivity. 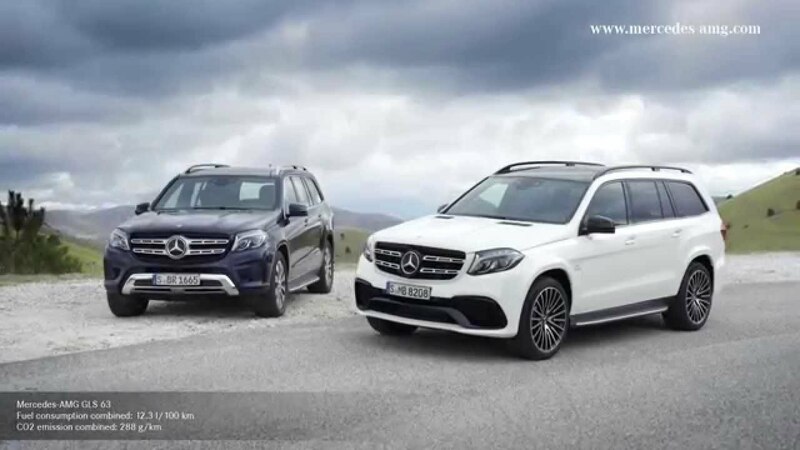 In order to strengthen its dominant appearance, the Mercedes-AMG GLS 63 comes with standard 21-inch (53.3 cm) AMG cross-spoke light-alloy wheels with 295/40 R21 on 10 J x 21 ET 46, in titanium gray with high-sheen finish. Optionally, this wheel is available in matte black with a high-sheen rim flange. The AMG Sports exhaust system, with two chrome-plated twin tailpipe trim elements, provides the rear end with sporty distinctive highlights. The emotional, typical AMG V8 sound is particularly powerful when accelerating and during double declutching. At a constant speed, the noise production is more reserved. With striking design elements in black, the optionally available Night package underscores the sporty, expressive character of the vehicle. The exterior mirrors and the A-wing, with insert in the front apron, are finished in high-gloss black. Additional highlights include the AMG cross-spoke light-alloy wheels in matte black with a high-sheen finish, the black twin tailpipes, as well as heat-insulating dark-tinted glass starting from the rear doors. The black roof rails, window weatherstrip and beltline trim strip round off the Night package. The AMG high-performance braking system impresses with its precision brake control and high fade resistance. With its large, perforated brake discs with all-round ventilation, it guarantees outstanding deceleration values. To this end, brake discs measuring 390 (diameter) x 36 mm with six-piston fixed caliper are used on the front axle, and 345 (diameter) x 26 mm brake discs with one-piston combined floating brake caliper is used on the rear axle. The brake calipers are optionally available in red, underscoring the performance of the braking system. After getting in, the original goal is no longer important. The 3-spoke AMG performance leather steering wheel with aluminum shift paddles pleases the hands, and the generous interior pleases all the senses. Outside, the pulse of the city; inside, pure tranquility. The best way to free your head is to concentrate on the pleasure of driving. A short tap on the DYNAMIC SELECT selector switch and the GLS will go from cruiser to athlete. Driver and front passenger benefit from new sport seats with an AMG-specific seat upholstery layout and optimized lateral support. "AMG" badges in the backrests of the first and second seat rows emphasize the passion for detail. The new 3-spoke AMG Performance steering wheel with flattened bottom section and silver-colored aluminum shift paddles allows for perfect vehicle control. The high-class nappa leather upholstery is available in black, espresso brown/black and porcelain/black. The partially integrated media display on the dashboard visualizes the different DYNAMIC SELECT drive programs, displaying animated graphics. The AMG instrument cluster offers an exciting AMG design and valuable information for sporty drivers. The AMG main menu is displayed in high resolution and in color on the central 11.4 cm (4.4-inch) multifunction display. The driver is kept informed about current temperatures and vehicle settings, and can clock and save lap times. Exclusivity and sportiness are visually underscored by the speedometer with its 320 km/h scale and AMG logo in the rev counter, AMG-specific lettering and red pointers. The precision of the instruments is highlighted by the bevel ring with fine scaling around the speedometer and rev counter. For outstanding vehicle control, the AMG Performance steering wheel is finished in nappa leather with a perforated grip area and a flattened bottom section. Silver-colored aluminum shift paddles emphasize the sporty appeal. Available as an optional extra is the AMG Performance steering wheel in black nappa leather/DINAMICA microfiber, for an even better grip when carrying out sporty driving maneuvers, this variant features a grip area upholstered in DINAMICA microfiber. The AMG sports seats offer excellent lateral support thanks to AMG-specific upholstery, with more pronounced contours and higher side bolsters at the front. Made of finest nappa leather, the AMG-specific seat upholstery layout, with stitching and the "AMG" badge in the front seat backrests, create an exclusive look and feel. The sporty nature of the vehicle is further accentuated by the perforated nappa leather. Overtake everyday life. Every day. Makes every day special: one of the most powerful production SUVs from AMG. The 8-cylinder biturbo engine generates 585 hp from a displacement of 5.5 liters and a mind-blowing 760 Nm of torque. A brief tap of the DYNAMIC SELECT lever and the GLS is transformed from cruiser to athlete. One step on the gas pedal and, 4.6 seconds later, the V8 engine has catapulted the SUV to 100 km/h. The AMG SPEEDSHIFT PLUS 7G-TRONIC ensures short shift times, uninterrupted propulsion and that the everyday disappears even faster in the rear view mirror. AIRMATIC Package Including ADS PLUS. With 7 gears, 5 transmission modes and ECO Start/Stop function, this transmission allows for extremely dynamic acceleration and ultra-short shift times, as well as a fuel-saving driving style. Depending on the desired driving style, the driver can choose between efficiency and comfort in "Comfort" transmission mode, sporty and ambitious in "Sport" mode, very sporty in "Sport+" mode, or their own settings in "Individual" mode. On icy and snow-covered roads, the special transmission mode for slippery surfaces is recommended. Gear changes are executed with virtually no interruption in tractive power. AMG SPEEDSHIFT PLUS 7G-TRONIC builds on the strengths of the 7G-TRONIC PLUS 7-speed automatic transmission, which combines high levels of ride comfort, driving pleasure and efficiency. The seven forward gears allow a wide ratio spread with low engine speed increments between the individual gears. This results in lightning-fast gear changes with pleasantly smooth transitions. Another forte of the AMG SPEEDSHIFT PLUS 7G-TRONIC transmission is the ability to downshift multiple gears, with the transmission being ultra-fast and responsive. With the ECO Start/Stop function, fuel consumption can be effectively reduced. It is available in all transmission modes except "Sport+." The combination of air suspension and the adaptive damping system, ADS PLUS, results in impressive ride comfort, while simultaneously ensuring excellent driving dynamics both on and off-road. The damping at each wheel adapts smoothly to the current driving situation and road surface conditions. When the dynamic driving demands are high, for example during fast cornering, the spring rate hardens automatically, thus reducing rolling and pitching. With the "Comfort" and "Sport" settings, AIRMATIC can be configured for more comfort or sportiness. Thanks to the pneumatic, all-round self-leveling suspension, the vehicle maintains a constant level, irrespective of the load. In order to increase off-road capability, this level can be raised by up to 60 mm. An overall maximum ground clearance of 232 mm is therefore possible. At high speeds, the suspension is automatically lowered by up to 15 mm, helping to reduce aerodynamic drag and improving handling stability. The DYNAMIC SELECT variable dynamic control system assigns fundamentally different characteristics to the five transmission modes of INDIVIDUAL, COMFORT, SLIPPERY, SPORT and SPORT+, which the driver can select using a rotary control on the center console. The system networks all the control systems, generating different driving experience parameters. SPORT and SPORT+ turn the Mercedes-AMG GLS 63 into a sporty, dynamic vehicle with pronounced longitudinal and lateral dynamics. In COMFORT, the emphasis is on relaxed, effortless cruising with the greatest possible energy efficiency. SLIPPERY optimizes handling on surfaces with low friction coefficients such as snow or ice. In addition, INDIVIDUAL mode enables the driver to program and store personal preferences in the individual control strategies. Excellent handling on any surface, ensured by 4MATIC permanent all-wheel drive in conjunction with ABS, ESP® and the 4ETS Electronic Traction System. On or off-road, in wet weather, ice or snow: traction, driving dynamics and driving stability are improved thanks to 4MATIC. The all-wheel drive system achieves this without the need for conventional differential locks. Instead, those wheels with insufficient traction are specifically braked, while torque is increased at those wheels with good traction. These fast, automatic braking impulses make it possible to achieve essentially the same effect as would be achieved with three differential locks. The main component of 4MATIC is a single-stage transfer case with an open planetary center differential, which balances the difference in speed between the axles. The defined power distribution of 40 : 60 between the front and rear axles guarantees effortlessly superior handling that is always predictable. The engine in the new Mercedes-AMG GLS 63, the AMG 5.5-liter V8 Biturbo, is now even more powerful. An increase of 20 kW (28 hp) to 430 kW (585 hp) delivers significantly improved performance that allows the Mercedes-AMG GLS 63 to accelerate from 0 to 100 km/h in 4.6 seconds (GL 63 AMG: 4.9 seconds). The linear power development peaks at a maximum torque of 760 Nm, which already kicks in at 1,750 crankshaft revolutions. Larger sized radiators at the front and special air outtake vents ensure the heat balance of the V8 power unit.